We have teamed up again with WP Elevation to deliver a fantastic webinar that will up your game with clients, and it’s all for free. 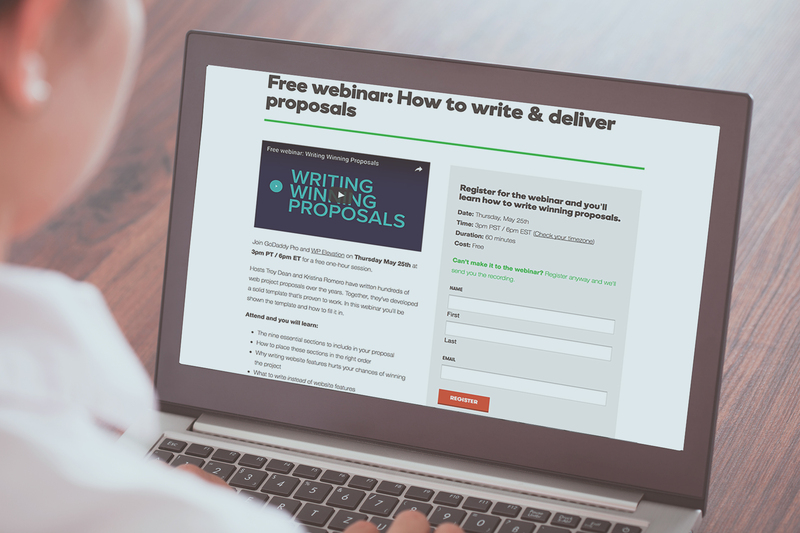 Join in and learn how to deliver and write proposals from Troy Dean and Kristina Romero. Together Troy and Kristina have come up with a bulletproof template for writing winning proposals to your clients. You can expect a step by step tutorial, and all of the resources to get you started will be provided on the call. For those who tuned in last time when we organized with the WP Elevation team the webinar focusing on recurring revenue, you will remember Kristina and Troy and their lively and enthusiastic teaching style. You can expect the same engaging delivery and a bucket full of useful information. This time round the webinar is part of the partnership series with GoDaddy, and you can register on there. You can sign up on the GoDaddy Garage webinar page. And if you cannot attend the webinar, we will send you the recording afterward. The webinar takes place on Thursday May 25th at 3pm PT / 6pm ET for a free one-hour session. All the downloads you need to start taking action will be provided on the call. Here is a video that will tell you a little bit more about the webinar itself. One of the most important skills to have is the ability to frame proposals the right way for your clients. As a professional, you need to be able to explain what is the true value of your services and how your work will impact your clients. This webinar will help you in doing just that, and you will have the opportunity to learn from seasoned professionals. WP Elevation is focusing this month all of their content on Mental Health as a way of bringing awareness to WordPress professionals. If this is a topic that is close to your heart or you want to help them in talking about this often taboo topic, reach out them by going here. Thank you. Next blogpost:It’s time for #WCBGD, and the hype is real! Connection to the GoDaddy page failed. GoDaddy Garage webinar page is the anchor link in the text. I might have already signed up guyrcook@gmail.com if not.